Three films in now, and the Divergent series – based on Veronica Ruth’s book trilogy – still hasn’t managed to impress us. 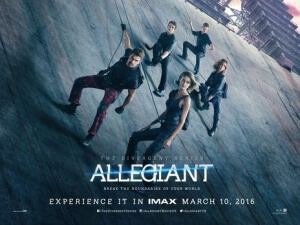 It’s actually pretty astonishing when you look at its continuing downward progression – the first film, simply called Divergent, managed to come out looking like a blander and more dull imitator of The Hunger Games; the second film, subtitled Insurgent, packed in more action but somehow ended up being less ambitious; and now the third, dubbed Allegiant, lowers the levels of interest so far down that James Cameron now needs to ascend into the depths to retrieve it. This is a series that makes us care less and less about anything that happens with each passing film, which is an achievement in and of itself. If by any chance you DO still give a damn about what’s going on, this film picks up right from where the last film left off (which we’re struggling to remember, hard as we try), where we find our personality-free heroine Tris (Shailene Woodley) and her other personality-free chums Four (Theo James), Peter (Miles Teller), Caleb (Ansel Elgort) and, erm, whoever Zoë Kravitz plays, venturing into the nuclear wasteland surrounding their walled-off home of desolate Chicago. From there, if you’ve seen Maze Runner: The Scorch Trials, then you can guess where it goes from there; they run into a government facility, turns out they can’t be trusted, they have to escape and save the day, you get it. It’s THAT kind of YA movie. But even as YA movies go, this one feels particularly redundant. Like its predecessors, it recycles a lot of plot points and even styles from its peers, from the disease-ridden post-apocalypse of Maze Runner to the futuristic technology and “golly, isn’t the future rubbish?” mentality of The Hunger Games, and more often than not the logic that this world seems to revolve around is pure nonsense. The whole thing with “divergents”, “dauntless” or any other thesaurus-ridden word they thrust upon us, was very difficult to understand previously, and even if it wasn’t it still doesn’t make any sense; why would anyone think that separating people based on certain personality traits, in methods you would find in your average quiz of the sort online, would actually hold water? We get how it was, and may still be, a regime hell-bent on suppressing emotions of any kind, but surely more than just a handful of people would be classed as neutral, or “divergent” in this case, and the whole system would fall apart in minutes? And if there are quite a few people like that, then why is only Tris treated as the one true saviour? What makes her so special, because it sure as hell isn’t her personality, which seems to be becoming more and more absent as time goes by, nor is it her intellect since she can’t seem to recognise the obvious bad guys as being untrustworthy. Maybe this series just isn’t for us, but we shouldn’t be shunned for thinking a lot of it is pretty stupid. What’s sad is that Woodley, the main reason why we’re always keen to keep coming back to these films, doesn’t even seem to want to be there anymore, no less than how other actors like Jeff Daniels, Naomi Watts, Octavia Spencer act like they’d rather be doing something more worth their time and talent. A lot of this film rests on the shoulders of Theo James, which is a bit of a mistake because the actor has all the charisma of a turd in a Jacuzzi, and shares about as much convincing chemistry with on-screen lover Woodley. Even behind the camera, you can sense that director Robert Schwentke is running out of steam because the actors’ delivery feels flatter than usual (one of them seems to wait for another one to get into place before carrying on with their line) and the over-reliance of CG effects and backgrounds are more distracting than they are serving the plot. You can sympathise, therefore, why Schwentke recently bowed out of returning for the next one. Oh yeah, we forgot to mention: Allegiant is actually the first of a two-part adaptation of the third book in the series, with Ascendant (directed by The Age of Adaline’s Lee Toland Krieger) out next year. So we’ve got just one more of these films to go, and after seeing how little we care by this point, we just want it to hurry up so we can get it over with. The Divergent Series: Allegiant makes an unimpressive case for our care and interest to continue to be invested in this series, with a dull and CG-infested world that makes little sense being inhabited by even duller and more artificial characters we simply don’t give a monkey’s about.